I found this dresser sitting in the cellar at an estate sale. Despite it's condition, I loved it immediately. There's nothing fancy about it; it's very old, it's very heavy, the drawers are huge and the hardware is to die for. 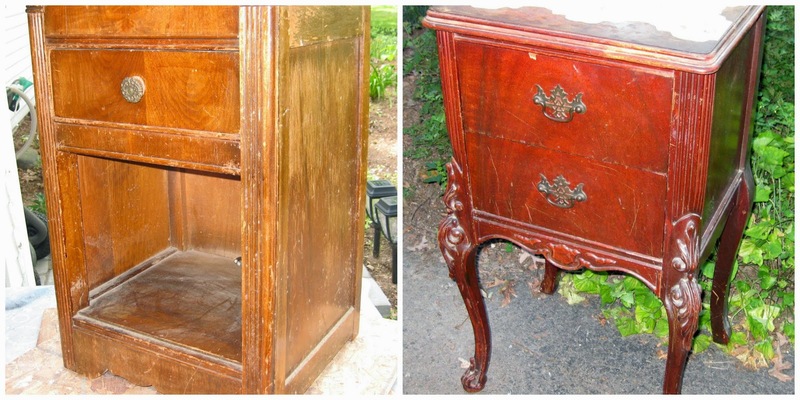 Old bin pulls with some extra detail - and, did I mention that the back of the dresser was missing? I do have the top drawer but I had already started working on it when I remembered to take the "before" photo. This is one of those rehabs that I was tempted to keep. 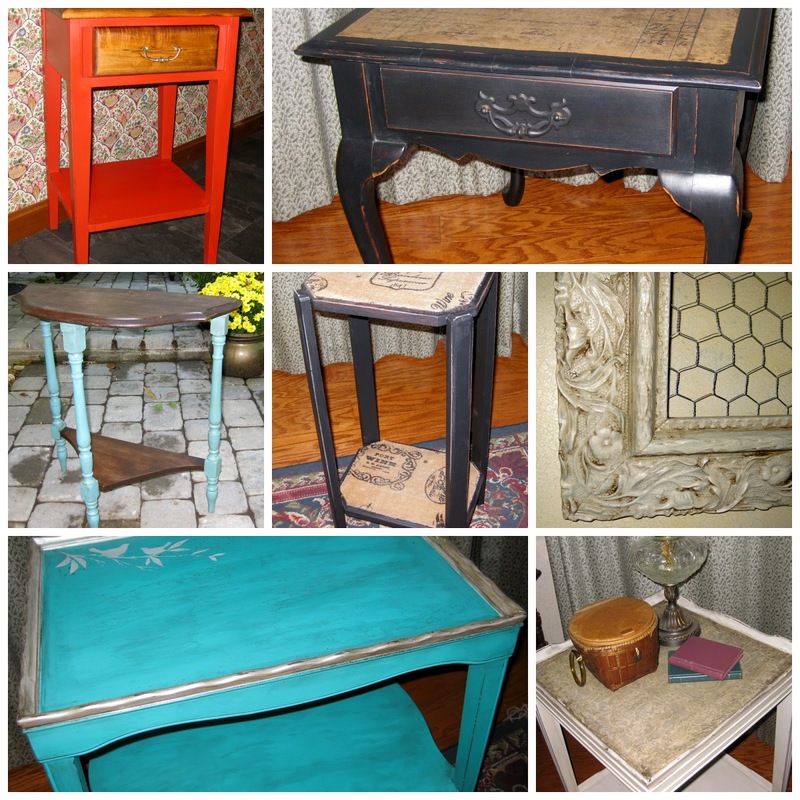 Have you every completed a project that you actually hoped didn't sell? I used Behr's Green Siding to make chalk paint, then glazed it with a custom color (looks like Hershey's chocolate syrup) of Sherwin Williams glaze. I applied the glaze with a damp sponge and found that I had a lot more control over the glaze. Up until now I've had a love/hate relationship with various glaze products I've tried but I think I've finally found an application method that works for me. It's waxed with Fiddes clear wax. The top is stained with Minwax Special Walnut and protected with three coats of Wipe On Poly. Here's a closeup of the original hardware that was cleaned and painted with flat black. Did I mention that I love it?? 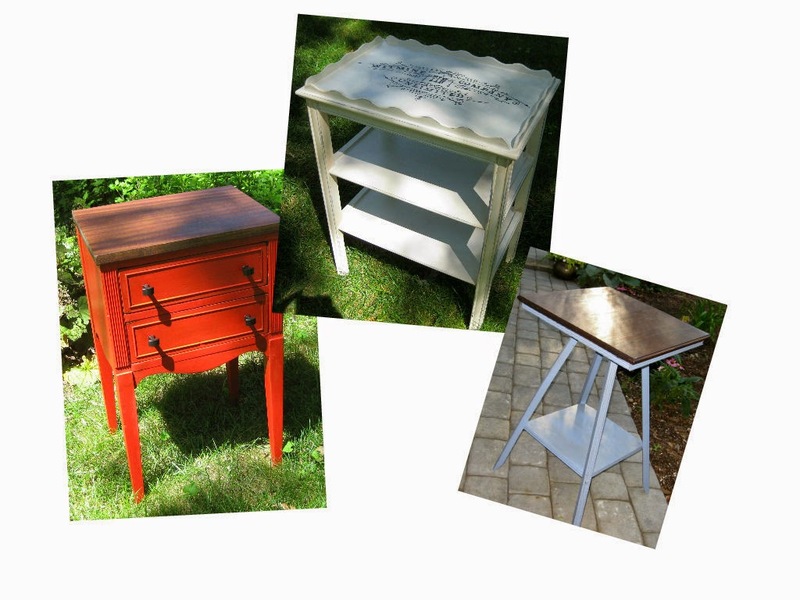 I finished up a couple of smaller pieces this week in between steps on a great dresser I've been working on. Both of them were found at yard sales and were looking very neglected. It was the best of times, it was the worst of times and there were two tables that had only one thing in common - both were yard sale rescues. No. 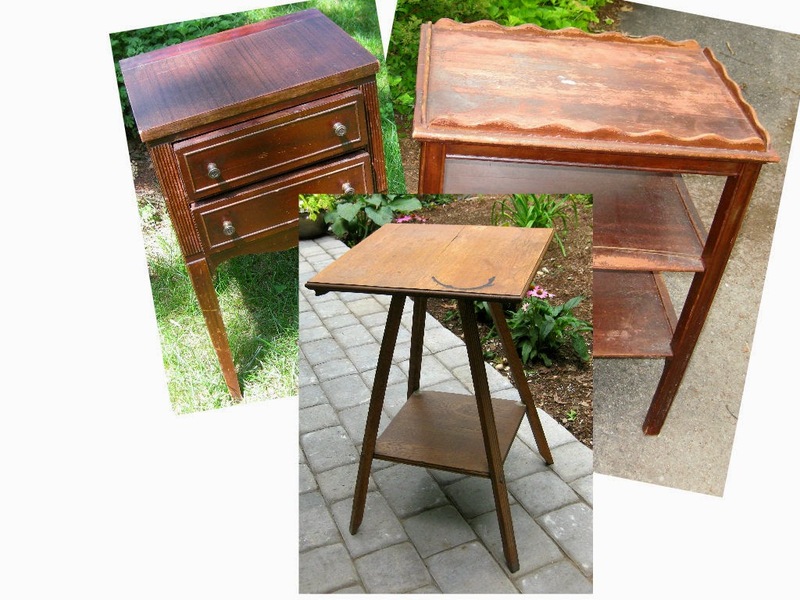 1 was a Waterfall-style nightstand from the 40's and table no. 2 had ornate, cabriole legs with two drawers and a "lovely" contact paper doily stuck to the top. I guess in someone's decorating eye the beautiful legs and the doily complemented each other (or maybe it was to distract from the peeling veneer), so here's a better shot of the top of No. 2. Rescuing furniture is always an adventure as you never know what you're going to find and there's an element of, "What were they thinking?" Table No. 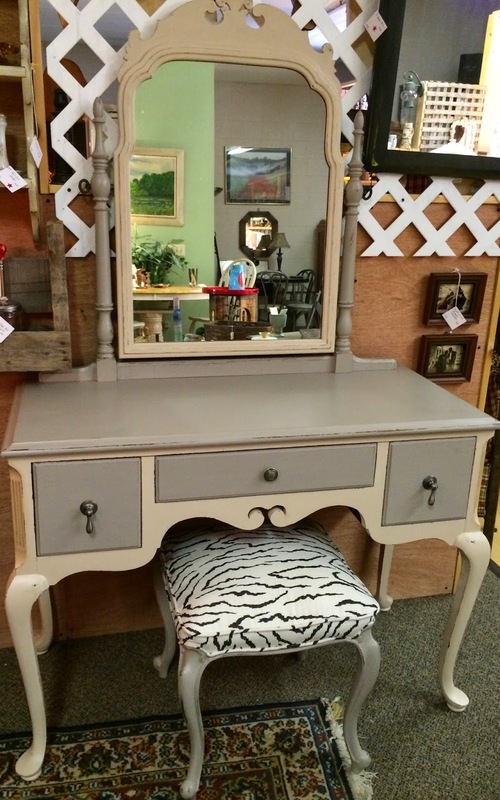 1 was cleaned & sanded, then painted with HM chalk paint using BM's Galveston Gray and the drawer & bottom shelf were painted with HM chalk paint using Behr Fresh Pineapple. It was lightly distressed and protected with black wax made by mixing APC black mica with APC clear wax. The knob on the original hardware was painted with nickle and the Bakelite back piece on the knob was cleaned and retained. Table No. 2 was cleaned & the contact paper was removed from the top, as well as two layers of peeling veneer. I was able to save the veneer on the two drawer fronts and retain the pretty pattern. 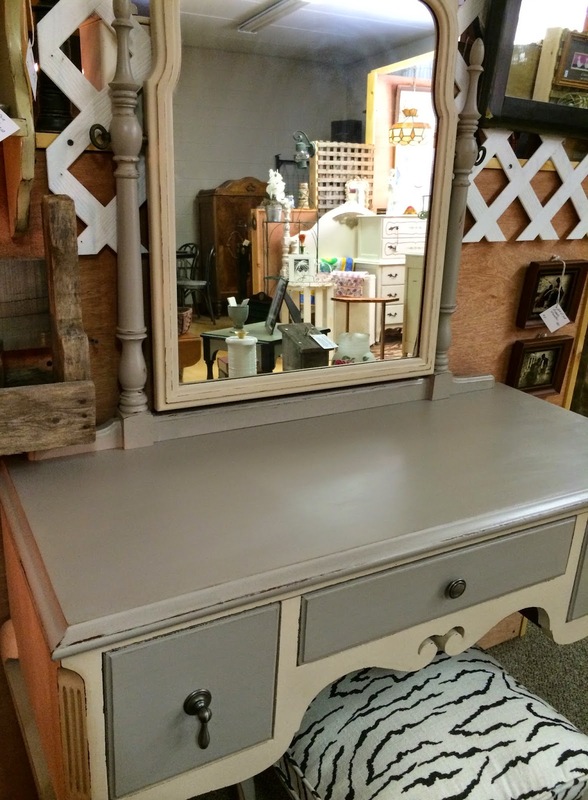 The table was painted with HM chalk paint using BM Twilight Zone. 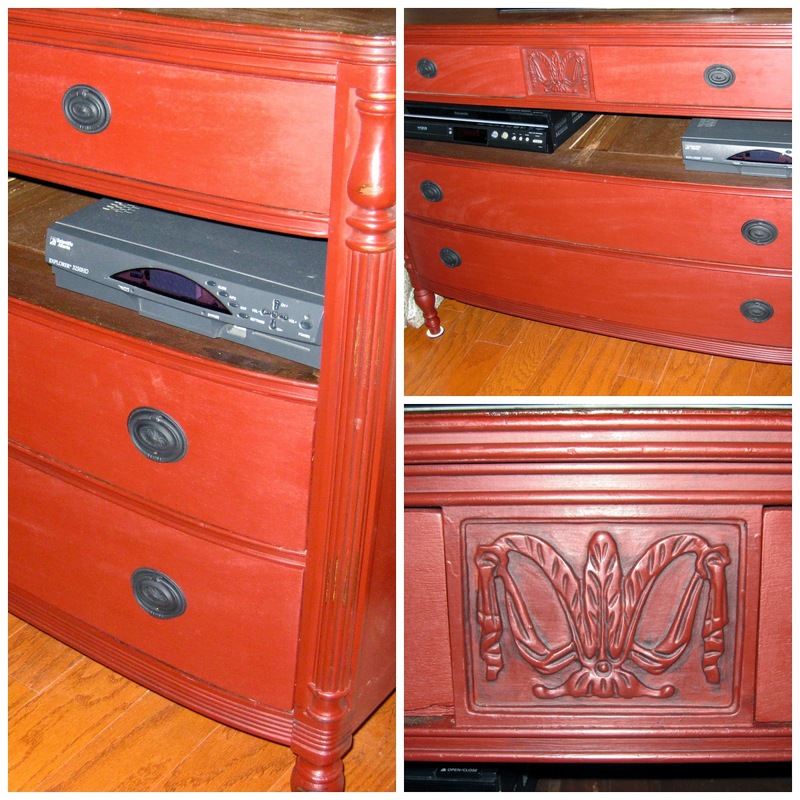 The top & drawers were stained with Red Devil English Walnut (don't know if they still make this stuff - it was an old can I had hanging around and I liked the color). Top & drawers were sealed with two coats of Wipe On Poly and the black has a protective coat of Fiddes Rugger Brown wax. I kept the original hardware - cleaned, sanded, then painted with flat black.